"We Were All Fish Once"
This week I am preaching on "Evangelism." 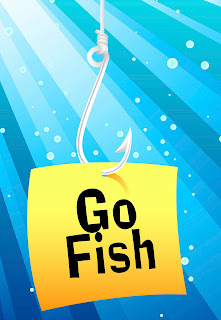 I'm actually preaching on "Evangelism" for three weeks as part of a sermon series called "Go Fish." Evangelism is one of those words that you just don't hear that much in mainline Protestant churches (you know Lutheran, Methodist, Episcopal, Presbyterian, etc.). Mainline churches are typically interested in almost every other aspect of Christianity but Evangelism. Even so-called Evangelical churches have taken to eschewing the word for other words like "Outreach" and "Connections." 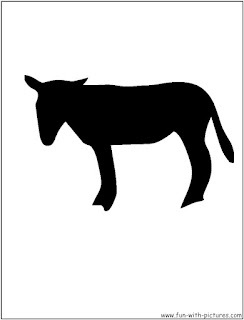 The reason for this is because the word "Evangelism" conjures up all sorts of negative images for so many people. For my own part, I think about televangelists, door to door "witnessing" and the like. I remember knocking on doors as a fundamentalist Christian middle schooler and asking people THE question: "If you died right now would you go to heaven or go to hell?" I was an impressive sight then with my short sleeved dress shirt, clip on tie, Brylcreem'd hair and enormous Bible. Frankly, I am surprised I didn't get beaten up. The word "evangelism" basically means "to bring good news." For a bunch of people who claim to have THE Good News of all good news... You'd think we'd have a handle on all of this. Here's the thing. The Church is not doing very well with Evangelism. 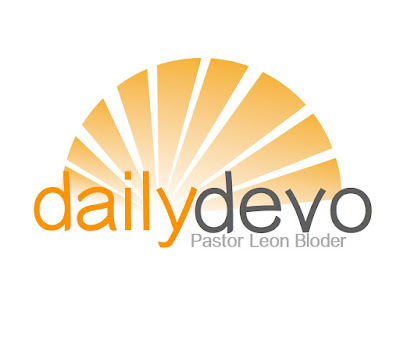 There was a study that was done recently in Mainline churches where thousands of mainline church members from various denominations were asked about the things that their church did well. Yup. Evangelism. I found this statistic recently that sobered me even further. When asked about their religious affiliation people who were part of a study on religion in America responded thusly: Only 3% of Older Adults (75 - 90-plus) said they had "no religious affiliation." Among Baby Boomers, 11% said that they had "no religious affiliation." The number jumped to 27% when it came to Millenials--people in their 20's to early 30's. It's clear that the Church is failing to reach emerging generations. HOWEVER the same study that uncovered evangelism was dead last in effective practices among mainline churches also discovered some "best practices" for churches who actually do evangelism well. Incidentally these are churches that are growing, vibrant and alive. As opposed to shrinking, irrelevant and dying... like most mainline churches. I call these the characteristics of a "Go Fish" church. 3. "Go Fish" church members eagerly say evangelism changes lives--including their own. 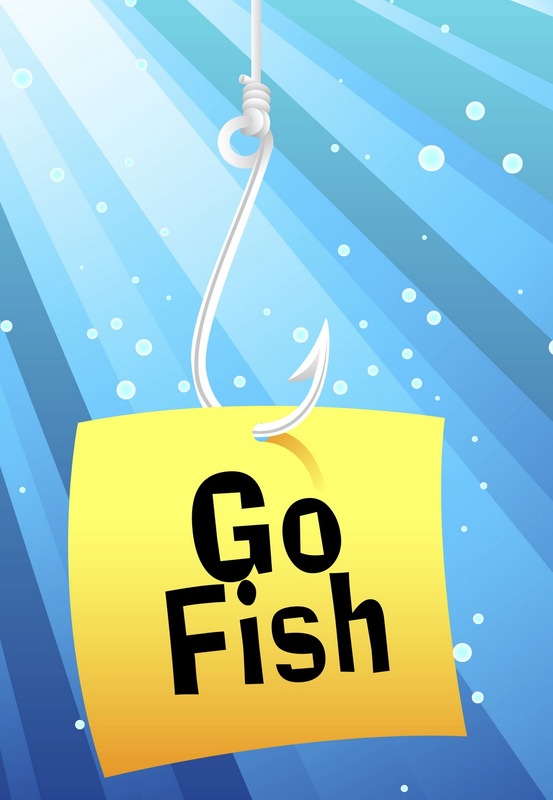 It is my hope and prayer that my own church can become a sold out "Go Fish" church--full of people who are fired up and wanting to share their faith with people who may not understand or have ever really heard the story of how God saved the world. But the thing that hangs up most Christians is their fear of evangelizing. They worry that they might not know all of the answers... or that they will turn people off, lose friends or alienate family members. They don't want to turn into one of those people. In Luke 5:1-11 we see the familiar story of the miraculous catch of fish. It seems Jesus was sitting in Peter's boat teaching on the shore of the Sea of Galilee when he suddenly told him to take the boats out and throw out his nets. Peter and his fishing partners had been fishing all night long and caught nothing. He points this out to Jesus, but out of respect he does as he's told. The men catch so many fish they barely can get back to shore. When they do, Peter falls down and confesses his frailty and sinfulness, basically telling Jesus he's not worthy to follow him. Jesus then says that great line, "Follow me, and I will make you fishers of men (literally, someone who "catches people alive"). Here's the thing... Peter had been "sort of" following Jesus up to that point. Jesus had even given him a new name---his "real" name was Simon--to commemorate his new identity (he called him "Cephas" which means "Rocky" or "Stony"). Even though he was a follower of Jesus in name, Peter hadn't really taken the plunge, so to speak. Jesus challenged Peter to obedience, and Peter accepted the challenge--not really knowing what might happen. And then Jesus called Peter to a new life--fulfilling the mission of sharing the good news that God was/is saving the world. I see so many of us Christians stuck where Peter was when he was just "sort of" following Jesus. We are Christians in name only. We see and hear the challenges to obedience when it comes to evangelism and sharing our faith, but we don't accept them. Most of us worry that we might become one of "those" people--the kind that kill conversations with their Christianese, the kind who are buzz kills at parties because they want to talk about Juh-ee-zus every five seconds. The kind that slick their hair with Brylcreme and go banging on doors. But when it comes down to it all we need to do is to share... us. Just share our story. It's about relational evangelism, the kind that can only take place when the person you are sharing your faith with actually knows you give a rip about them as a person. 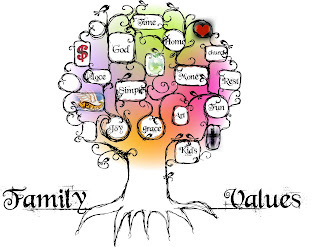 You don't have to know all of the Biblical answers to all of the Biblical questions. You don't need to understand all of the complexity and intricacies of theological discourse. In fact, it's probably better to keep that stuff to yourself even if you do! Truett Cathy, the founder of Chik-Fil-A once said, "People don't care how much you know, until you know how much you care." I broke this down for my congregation into three things: Know Your Story, Tell Your Story and Thank You Card. First, you have to know your own story. If you call yourself a Christian, and you don't have a story, if you can't feel anything that resembles excitement when it comes to your faith or a relationship with Christ... you might want to check into that. And you need to tell your story once you have it. Don't be shy to share your own experiences with God. The man who was blind and given his sight by Jesus had this to say about his transformation: "One thing I do know... I was blind, and now I see." Finally, you need to write a Thank You card. I know. It seems strange, but you need to do it. Think of the person who invested in you. Think of the person who knew you when you were a "fish" and shared their faith and their story with you. They loved you enough to give you the greatest gift they could think of... the story of how God saved/is saving them. Write them a letter. Thank them for what they did for you. If they aren't alive anymore, do it anyway. I bet they'll hear you read it.